Do you expect comfortable atmosphere, excellent service and tasty cooked dishes from a restaurant? But are you ready for the sake of tasting delicious dishes and testing the limit of your own abilities to climb up a rock to get into a restaurant, or to climb up to the volcano's vest or, on the contrary, to hit bottom? In the world, there are many unique restaurants that can surprise visitors with their hard-to-reach location, original thematic decoration and unusual entertainment. 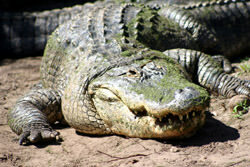 To enjoy visiting some of them, you will need strong nerves and a good sense of humor. Anyway, all the restaurants presented in the review are unique and have every right to be called the most original restaurants of the planet. The unique restaurant 'Hua Shan', located on the summit of one of the mountains in the province of Shanxi, is probably the most dangerous and usually inaccessible restaurant on earth. Its main particularity is its hard-to-reach location - the restaurant was open on the top of the mountain. The way to him is incredibly difficult and dangerous. Only the most courageous tourists dare to go this way. You can reach the designated mountain district by cable car. This route of the route is the easiest and most convenient. From a certain point you can reach the restaurant only by foot. The path stretches through the fine little wooden bridges, which are laid out over the abyss. You can hold a massive metal chain. To taste the delicious specialties of the strange Bergrestaurant and to enjoy the picturesque panorama from its cozy hall, you have to literally climb onto the rock and risk your life. The last stage of the difficult route is the hike on the mountain crest, on which the staircase was carved. 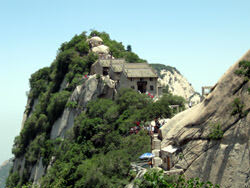 For this hard test you will be very well rewarded - all courageous travelers can dine free in the restaurant 'Hua Shan'. 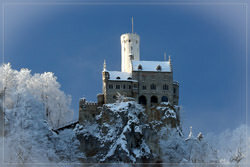 The restaurant is located on the summit of the mountain of the same name, at the height of 2 160 meters above sea level. 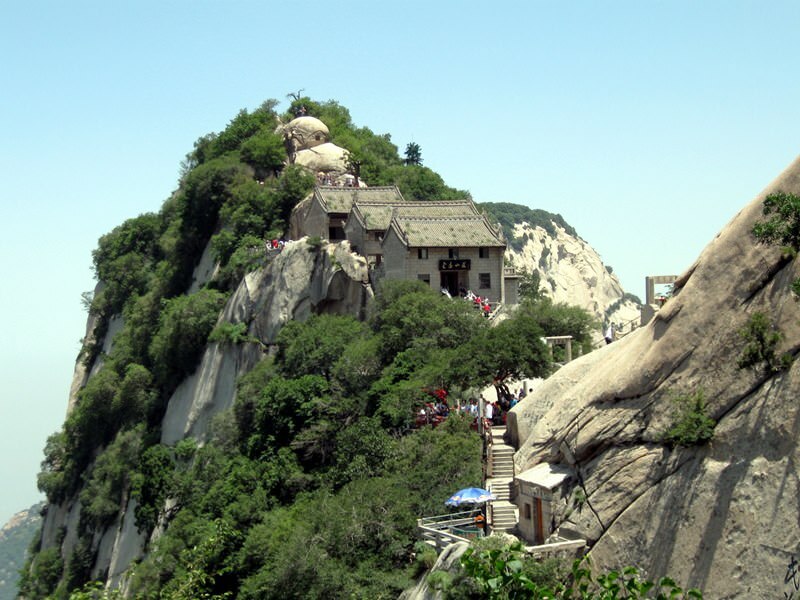 Hua Shan is considered a holy mountain for the people who profess Dauism. The mountain is popular not only among the pilgrims, but also among modern supporters of extreme recreation. The mountain path, full of dangers and obstacles, is considered one of the most complicated paths in the world. 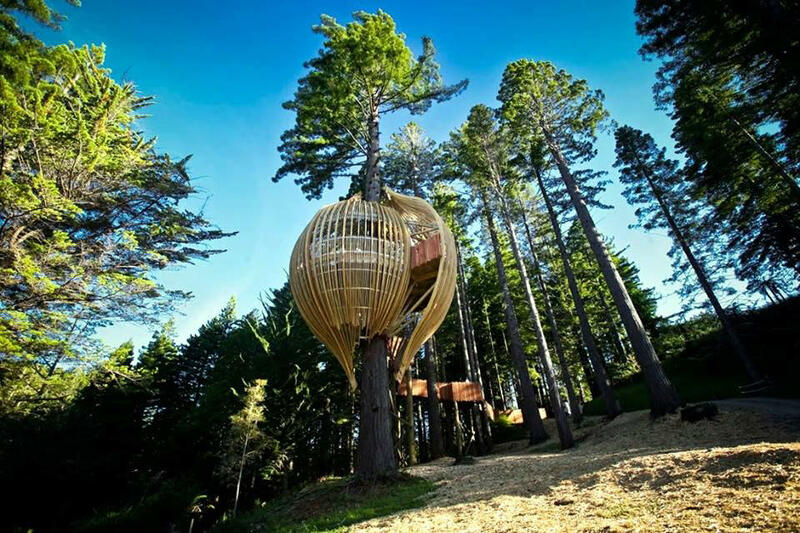 Those who do not want to climb into the mountains in search of the cozy restaurant can walk in the surroundings of Auckland and find the romantic Café Yellow Treehouse in one of the picturesque forests. At first sight you can hardly recognize a restaurant. 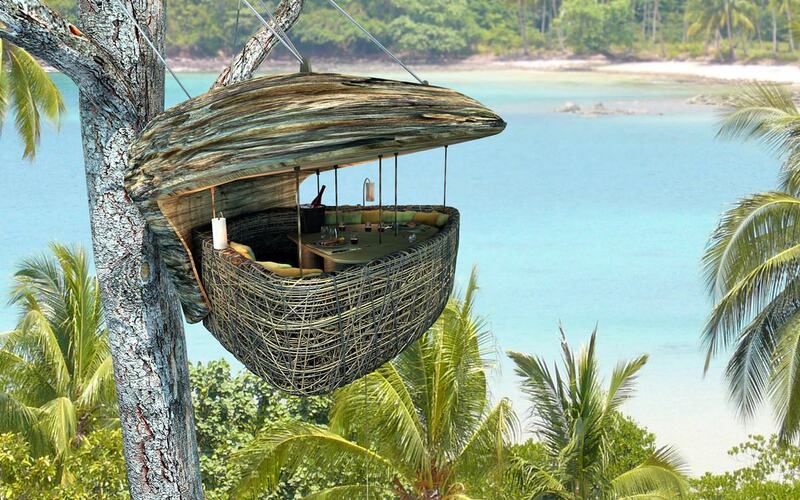 The café has the form of the small cocoon, which was built in height to the tree trunk. 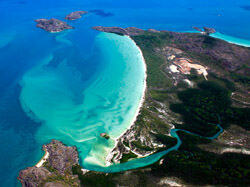 The authors of the original project were the architects from Pacific Environment Society. The cafe, which they presented, was opened as part of the environmental protection campaign. The cozy café will definitely please those visitors who are looking for an original place for romantic dinners or who like to build tree houses in childhood. The cocoon restaurant built around the Sequoiestamm offers visitors the exquisite dishes, so the gourmets will not be disappointed. Located at a height of 12 meters, the restaurant has a fairly small area and can only receive 18 visitors once. For the small table, guests can climb up the comfortable wooden staircase. When constructing the unusual café, only the environmentally friendly materials were used. Guests wishing to organize a romantic dinner or a celebration in Yellow Treehouse should take into account that the table in the restaurant can only be ordered in advance. There are always very many visitors in the restaurant, so you have to book the table in advance. The romantic and unusual restaurants can be found not only high in the mountains and in tree tops, but also under the water. 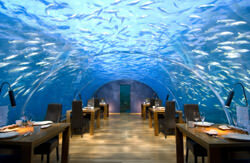 In 2005, Ithaa ('Pearl') - the first underwater restaurant in the world - was opened in the Maldives. The restaurant immediately became one of the most famous and chic restaurants on earth. 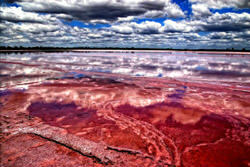 It lies on the depth of about 5 meters and is located in the small transparent capsule. Through the transparent vaulted ceilings and the hall walls one can enjoy the beauty of the underwater world. To enter the underwater restaurant, guests have to descend the spiral staircase from the special deck. The restaurant specializes in the dishes of Maldivian cuisine. In his menu you can find many exquisite delicacies. The restaurant is located on the picturesque island of Rengali and is part of the luxurious Hilton Worldwide hotel, which is popular among the richest tourists. The technical design of the restaurant is quite simple. Its dome is made of lightweight high-strength acrylic glass, which is commonly used for decorative aquariums. 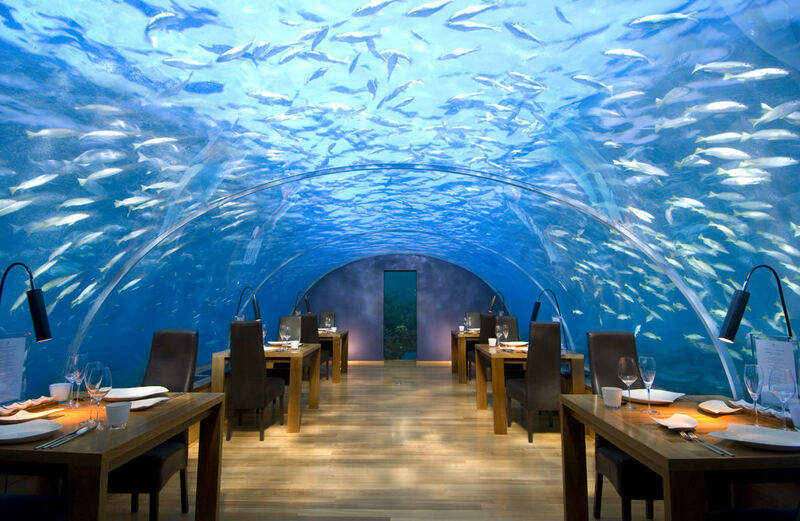 The high-strength glass holds high pressure, so the underwater restaurant is not only fairy-tale beautiful, but also quite safe. 'Pearl' is one of the most unique and expensive restaurants in the world. The average price of lunch for two people is about 120 US dollars. The dining room can accommodate up to 14 people, so it is recommended to book the table for at least 2 weeks. Located on the Thai island of Kood, the Dining Dining Pod is popular with nature lovers and those who enjoy spending time outdoors. 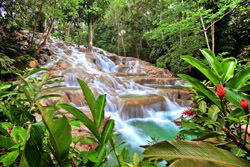 This exquisite restaurant of Thai cuisine was built in the wonderful tropical forest, not far from the coast. The restaurant consists of four wooden structures, which are fixed in the tree tops, at the height of more than 6 meters. The shape of the structure is reminiscent of the wicker baskets, the upper part of which is open and supplemented with the small canopy, so the guests can enjoy the picturesque panorama of the surroundings during the meal. The original restaurant belongs to the infrastructure of the chic Hotel Soneva Kiri and is very popular among gourmets. In the restaurant, the best cooks work, and the Chefkoch was awarded two Michelin stars, so the guests of the quality of the food is certainly not disappointed. The service level in the restaurant is just as excellent. For the convenience of the waiters, the 'baskets' were connected to each other by the convenient cableway system. When serving the customers, the waiters literally 'fly' between the tree tops. The skill of these specialists can only be admired. Travelers who want to taste the popular Thai cuisine at the Dining Pod restaurant should take into account that Dining Pod can only accommodate 8 visitors. As a rule, the cozy baskets hidden in the crowns are reserved for several weeks. Another great way to enjoy delicious dishes on the heights - to book a table at the popular Brussels Dinner Dinner in the Sky. This open-air restaurant is a small platform with transparent canopy which has the height of 50 meters. Once the platform can receive 22 visitors. The guests are served by 4 employees of the restaurant - the waiter, the cook, the security man and the musician. The original restaurants, where you can dine in heaven, was opened in 2006 and has been incredibly popular since the first days. 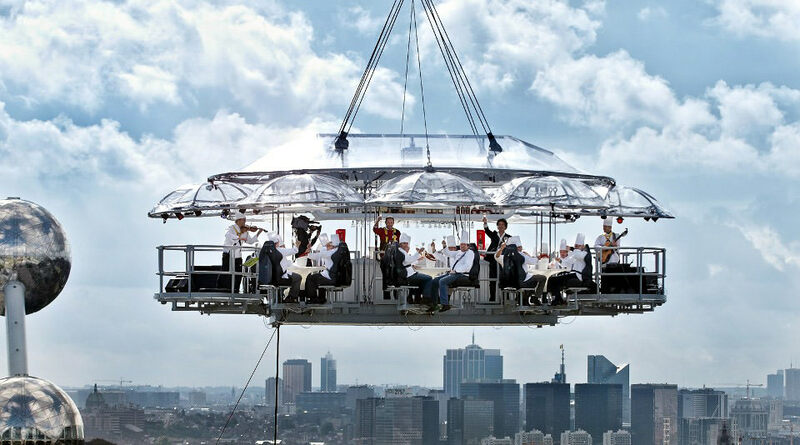 At the moment there are similar restaurants in the other European cities, but Belgian dinner in the Sky remains the most popular and famous among them. Despite the impressively high prices, the restaurant has never lacked the customer. To book the platform for a few hours, you must pay at least 20,000 US Dollars. On a special order, a platform next door can be raised, on which the piano is set up. The more frugal guests can dine with the violin. The second most populous restaurant of the network is in Vienna and was opened a few years ago. Dinner in the Sky is an excellent restaurant for those travelers who want to get hungry after new impressions and change their everyday life. 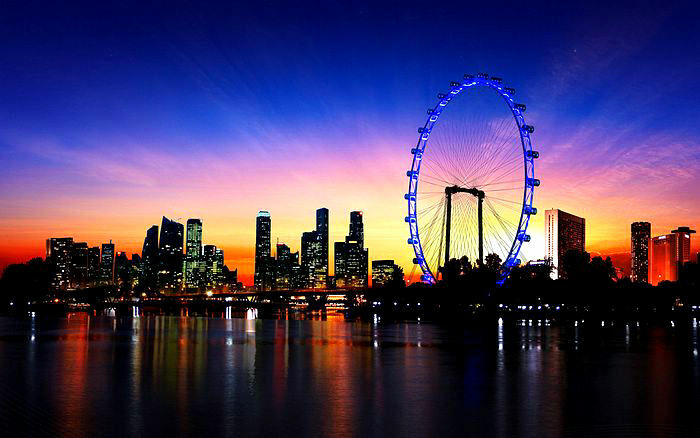 Located in Singapore, the Singapore Flyer, which is the largest ferris wheel on earth, also serves as the location of one of the highest restaurants. The tables of the restaurant of the same name are located in the enclosed glass cubicles of the Riesenrad. A better restaurant for romantic dinner in Singapore can hardly be found. The maximum height reached by the ferris wheel cabins is 165 meters. From the highest point, the magnificent panorama opens onto the island, and in the clear weather one can see from the Ferris wheel the Malaysian and Indonesian islands. The ferris wheel has 28 cabins, each of which can accommodate up to 28 people. The large cabins have long been popular among the newlyweds, who perform the wedding ceremonies, and are also used as a venue for banquets. 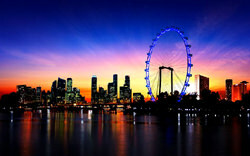 The Singapore Flyer Restaurant is one of the most sumptuous and chic in Singapore. This luxurious facility offers the Hofmannservices to all visitors. In the surroundings of Pisa, there is a striking historical sight - the Fortezza Medicea Castle, the largest part of its existence as the site of the high-security prison. A few years ago the historical prison was opened for the excursions. Later, the 'prison restaurant' of the same name was opened. To sample its specialties, guests have to observe some rules. It is forbidden to bring cell phones and bags to jail. At the entrance, all visitors are searched using a metal search device. The visitors have a chance to attract a real prison form, which will make the impressions even sharper. 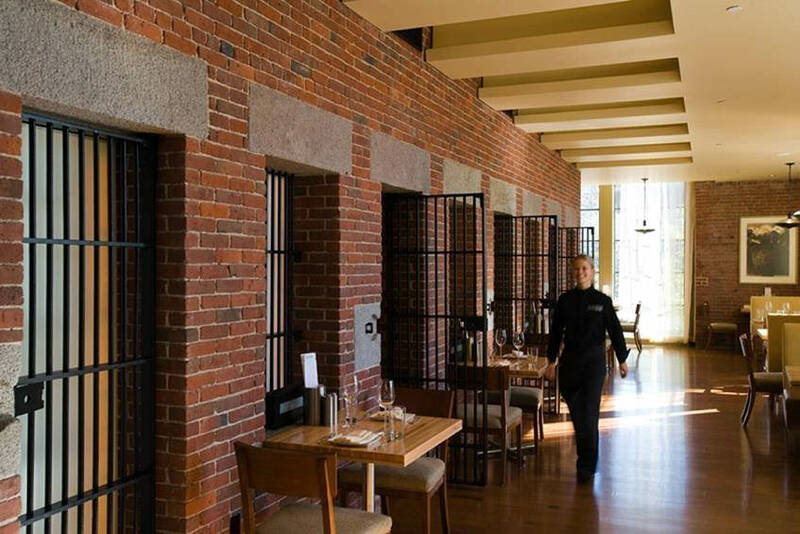 The restaurant still has an important distinctive feature - all its staff consists exclusively of prisoners who are punished in the old prison. The prisoners cook the food for the visitors and serve them personally, some of them playing different musical instruments. The spacious dining room, which accommodates about a hundred guests, was furnished in the prison dining room. During the reconstruction, the original equipment was completely preserved. Even the most economical tourists can have dinner in one of the most original restaurants on the planet. Dinner costs about 25 euros. The humble 'prison feast' consists of a meal and a glass of wine. All the dishes presented in the menu are fairly simple; Paste is one of the most popular among them. The whole world knows the love of the Japanese to sushi. Only few people but know that in Tokyo one of the strangest and at the same frightening sushi restaurant - Cannibalistic Sushi is located. The beautiful tradition of serving sushi on the body of the naked woman is also known worldwide. According to one of the versions, this tradition has led to the opening of the unique 'cannibal restaurant'. The usual sushi is served here in the special way. The hall of Cannabalistic Sushi looks more like a real corpse hall. After the order the guests wait for the waiter, who leads the 'body' to them. In front of the visitors' eyes the skilled waiter dissects the body with the help of scalpels and offers the guests to catch the meal. Sushi is hidden within the realistic model. The service process and the autopsy are incredibly realistic thanks to the special effects. The people with a weak nervous system can no longer have the desire to eat. The original packaging of the dish made from dough, and the special sauce imitates the blood. Absolutely all parts of the corpse are edible, but not all guests dare to try them. Guests of the unusual Tokyo restaurant can choose either men's or women's body. If you want to 'personally dissect the corpse', you should not be afraid of the 'bloody' sauce. What you see inside the realistic packaging is even more impressive - all the sushi and sashimi have the form of human organs. No sooner will the rational man ever come to the feast in the toilet. However, this idea does not seem so illogical and unfulfillable. And thanks to the modern bathroom in the city of Xin Gao. Its fashionable and colorful hall is more reminiscent of the WC. The traditional tables are replaced by baths with transparent glass plate, and the chairs - by the ordinary Klobecken. The dishes and the dining room in this original restaurant corresponds to the general theme. The ordinary bowls for soup are replaced by bowls in the shape of the bowl. The drinks are served in the glasses, which look like an ordinary pissoir. There are currently 11 themed restaurants in Taiwan. 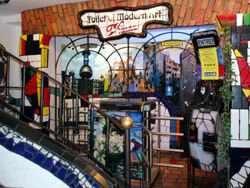 The 'toilet restaurant' can also be found in popular Taipei. And recently, the first restaurant outside the country, opened in Hong Kong. All the thematic restaurants are characterized by their unique interior design. In their halls you can see a lot of original toys. 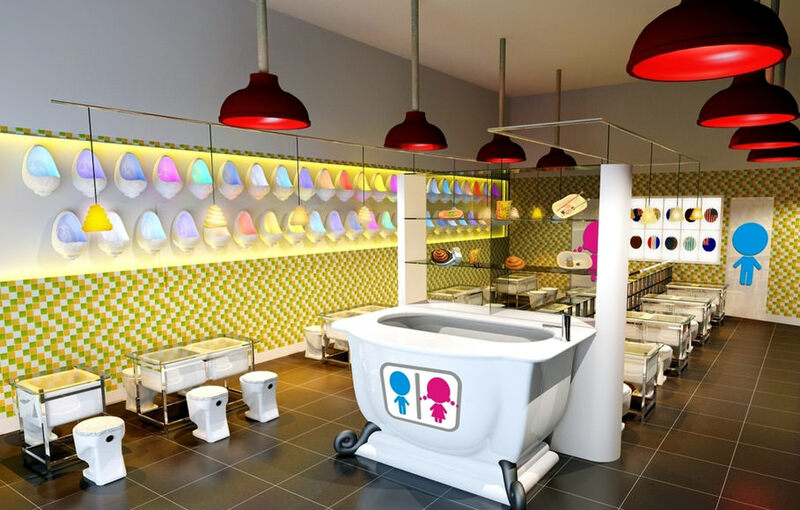 The restaurant Modern Toilet will definitely please the guests who have sense of humor. Since the opening, all original restaurants have been requested by the creative youth. From popular youth restaurants you can not always expect the 'Haute cuisine' and the faultless service. These small defects are offset by cheap prices. Many tourists visit the original restaurants instead of an excursion and order the ice as dessert, which is also characterized by very original thematic serving. Those who love to relax in the unusual places that visit Taipei can visit the thematic restaurant DS Music. The restaurant is dedicated to medicine. At the entrance, visitors are greeted by the friendly hospital staff in white doctor coats and bonnets. The food is brought to the table on the medical carriages. The dishes are also very original - the low-alcohol spirits and the non-alcoholic drinks can be served in the drip-bottle, and the strong drinks - in the real syringes. The real medical supplies were used in setting up the thematic restaurant. The restaurant DS Music is a must to those guests, who are not afraid and disgust of eating at the real surgical table. In the original restaurant there are no ordinary chairs, which are replaced by the sick beds and wheelchairs. A very interesting surprise awaits the visitors, who order one of the specialties in this extravagant restaurant - the dishes are served here in the peculiar bowls that remind the real ducks. The nice waitresses in snow-white coats are probably the most attractive feature of this restaurant Taipei. They teach the visitors to use the surgical instruments instead of the ordinary eating utensils and show how to 'insert the drip bottle properly'. Many like romantic candlelight dinner. There are people who come to enjoy the exquisite dishes in full darkness. A few years after the opening, the restaurants of the Opaque network have become very popular in the USA. These restaurants offer guests the opportunity to taste the specialties in full darkness. The regular customers claim that the entire darkness significantly enhances the taste sensation and makes the favorite food even more delicious. When eating in the original restaurant you have to observe some rules. At the entrance, the guests should put away all electronic devices, including the clock with a display. Then the waiters will tie their eyes with a black ribbon and lead to the quiet room to the cozy little table. The customers of the original restaurant are served by the usual waiters, who use the special night vision equipment for convenience. 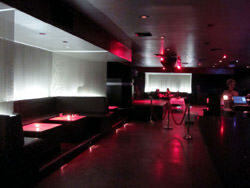 The first restaurant of the Opaque network was opened in Los Angeles. Today you can also visit the similar restaurants in San Diego, San Francisco, Dallas and New York. A few years ago the analogue of the popular American restaurant was opened in Moscow under the name 'In the dark'. Its main particularity is the fact that the visitors are served by the blind waiters. Despite the particularity of the Opaque restaurant, its visitors always count on high service quality and on excellent taste of the food. Absence from the bright light does not impair the operation of the customers and the cooking process. At present, there are many original ice-cream parlors around the world. The first of them - Lumi Linna Castle - was opened in the Finnish town of Kemi and is part of the chic ice hotel. 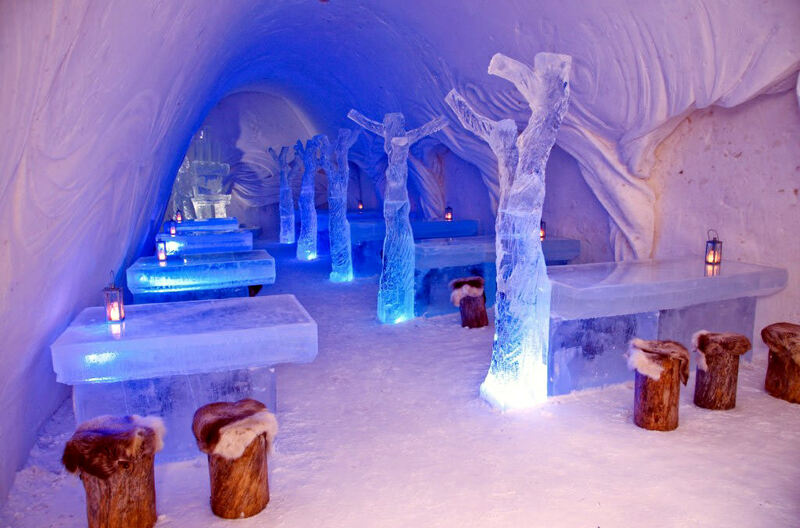 The room of the restaurant is built entirely from the ice and decorated with the incredibly beautiful ice sculptures and chiselled blue ice furniture, covered with real fur. The restaurant maintains the constant temperature, which is about -5 degrees Celsius, so it is recommended to all visitors to wear themselves warm. Thanks to the beautiful lighting the restaurant hall looks simply magical. When you eat here you do not notice any cold. 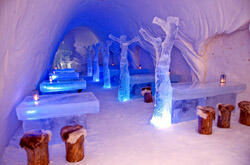 Just like the ice hotel, the ice restaurant is rebuilt every year, so its interior equipment changes every year. The best designers and painters of the world are working on the design of the restaurant, which, according to individual sketches, carve out the wonderful sculptures and set up the harmonious lighting system. The original ice restaurant can visit modern tourists not only in Kemi, but also in Moscow. 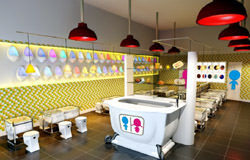 Recently, the ice cream restaurant was also opened in Dubai. One of the most striking natural sights of Spain is the volcano Ilario, which last erupted in 1824. In 1969 the 'diabolic' restaurant El Diablo was opened on the volcano peak above the crater. The skilled cooks cook the barbecue specialties just above the volcano crater. The original restaurant will definitely please the guests who like the grilled dishes and the rest in the unusual places. 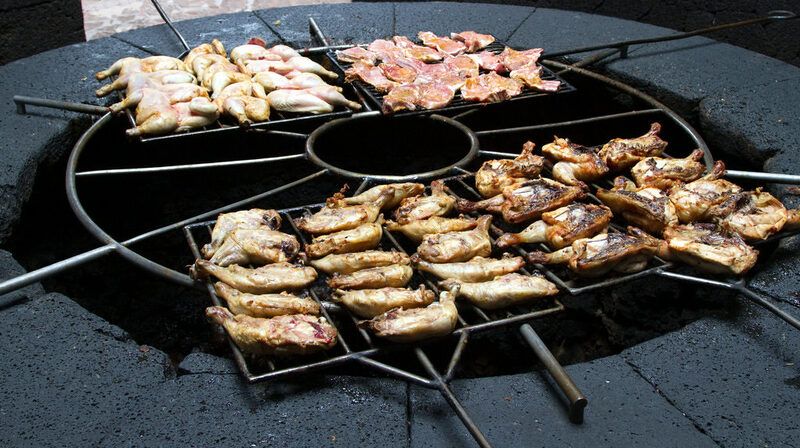 The heat from the crater of the extinct volcano is so hot, that you can fry poultry and large pieces of meat in just a few minutes. The delicate marine products are even stifled in less time. Guests of the restaurant can sit in the large dining room with panoramic windows. At the table on the top of the mountain you can enjoy the magnificent panorama of the surroundings. Usually the most curious visitors go to the open kitchen, in the center of which is the large round charcoal. All guests can watch the cooking process, as well as a lot of incredible original photos. The author of the project of this unusual restaurant is the well-known designer Cesar Manrique. In order to make the restaurant comfortable for the visitors, it was decided to protect it against the volcanic heat with the help of basalt foundations. The unique restaurant does not need any additional electrical or thermal supply. Volcanic heat is all that its cooks need for cooking the specialties. 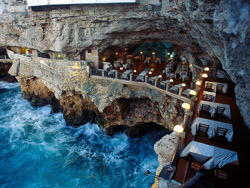 The most famous cave restaurant in the world is located in the tiny Italian town of Polignano-a-Mare. Grotta Palazzese is characterized by the incredibly splendid and refined decor. The restaurant is located in fairytale beautiful natural terrain, not far from the coast. His interior was decorated in a spacious limestone cave. For the opening of the restaurant were the large wooden terraces in the grotto equipped, on the later the tables were set up. 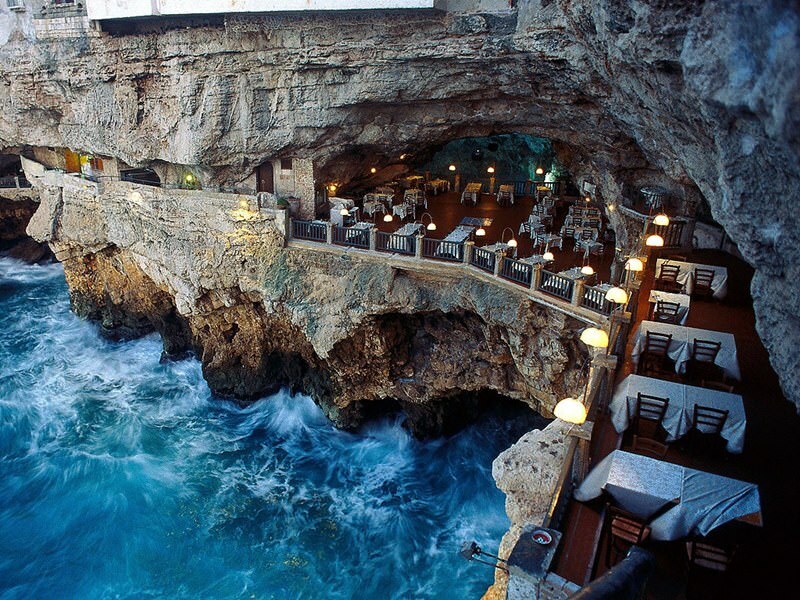 Today Grotta Palazzese is one of the most beautiful restaurants in Italy. The guests of the restaurant can sit at one of the unified tables deep in the cave or at the table at the exit, from which one can enjoy the wonderful panorama of the coast. As far as the distinctive features of the restaurant are concerned, one must especially mention its lighting. Thanks to hundreds of bright lamps built into the cave walls, the romantic atmosphere is always present in the original dining room. The lime cave, one of the most famous restaurants on the planet, is 25 meters above sea level, so you can admire the impressive coastal panorama. The restaurant's menu will appeal to the gourmets who like seafood. Here you can taste the delicious Thai-style squid, as well as the grilled shrimp with garlic. The prices in the restaurant Grotta Palazzese are quite high. The average price for a court is more than 100 US dollars. 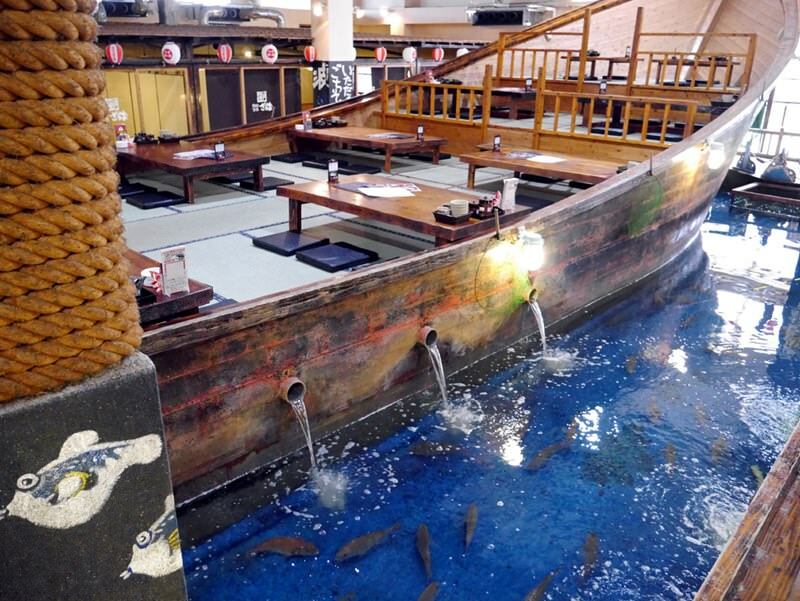 The well-known Zauo Fishing restaurant, located in Tokyo, is remarkable in that it offers guests the opportunity to catch their lunch in person. As one can guess from the name, the restaurant specializes in the fish dishes. 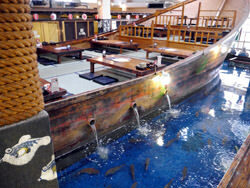 In the middle of its large hall is a cozy terrace with the tables, which is stylized as a ship's hat. The terrace is surrounded by the huge pool with numerous swimming fish. Guests can rent the fishing rod and all the necessary equipment and catch the fish independently. The visitors, who have not yet mastered the beginnings of fishing, can ask the experienced staff for help. At the request of the client the waiters will pick up any fish from the pool and cook according to the original recipe. The selection of fish in the pool is simply huge and will satisfy both the thrifty visitors as well as the gourmets and the supporters of the exquisite delicacies. When tasting the specialties, visitors to the restaurant can watch the newly arrived guests try to catch their lunch or dinner. In the restaurant Zauo Fishing there is always a very funny and informal atmosphere. Sea mackerel, mackerel, mackerel and red snapper, as well as the rare ball fish - the guests have an excellent opportunity to improve the fishing championship and complement the gastronomic experience with the tasting of the exquisite dishes. The food from the fish, which the visitor has caught himself, cost much less than the dishes presented in the menu. Therefore, in the restaurant Zauo Fishing for relatively little money not only delicious food, but also have a lot of fun.